The following article was first published in the April 5, 2005 edition of The Inverness Oran. It is re-printed here with the kind permission of the author, Frank MacDonald. The Causeway is, in fact, a voyage of the heart for many, and the mere sight of it can cause even the strongest man to weep, and the weakest and battered woman to regain her faith in life. It is where the heart makes its decision to survive, to forgive, to move on or, inevitably in spirit or in body, to come home. From its hilarious opening passage by Mary Morrison (BetteMacDonald to its poignant farewell by author-editor Elaine Ingalls Hogg, When Canada Joined Cape Breton is a medley of memories collected over the past three years and compiled in the publication which was launched in Port Hawkesbury last Thursday to mark the 50th anniversary of the opening of the Canso Causeway. When Canada joined Cape Breton (Nimbus) winds its way across the decades much the way the design of the Canso Causeway seems to meander across the Strait of Canso. In a series of nine chapters, Hogg allows her contributors to tell the story of this great undertaking from concept through construction to its memorable opening in August of 1954 to its 25th anniversary into the present and projecting another half-century into the future. 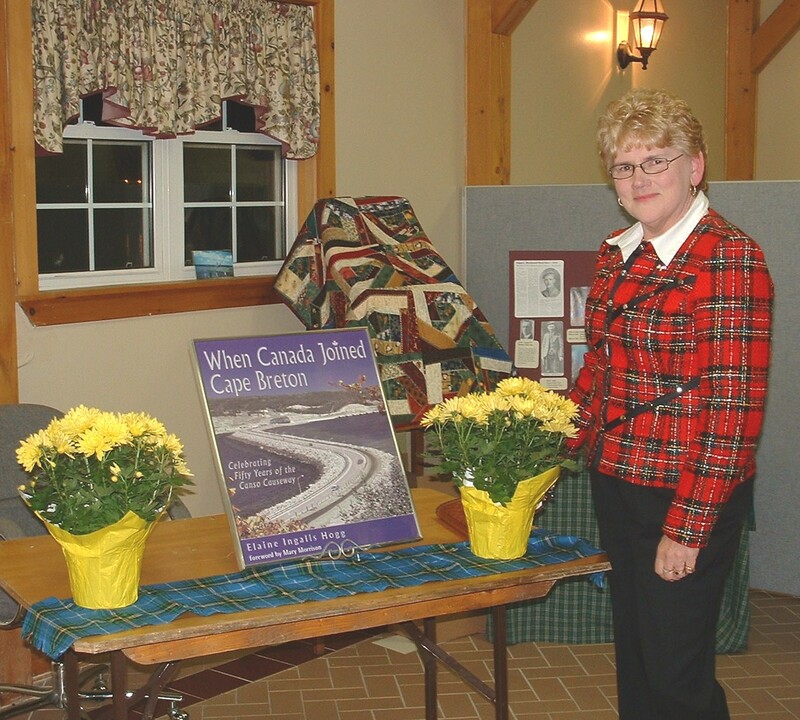 The single story unfolds through dozens of voices who have shared their memories of the Canso Causeway with Elaine Hogg. The Canso Causeway has played a significant role in Hoggs’ life. At the jammed book launch at Port Hawkesbury’s Creamery, the New Brunswick-born author told how she had moved 20 times in her first 21 years, and then crossed the Canso Causeway into Cape Breton which became her home for the next 29 years. Two years ago, she crossed the Causeway again when circumstances brought her back to New Brunswick. In compiling the collection of tales, Hogg discovered she was not alone in her longing absence. Her call for stories for this book brought responses from Cape Breton, naturally, but also from Cape Bretoners scattered across the globe, from the mainland to Florida to Bermuda. Those stories touch upon every emotion the Canso Causeway has evoked, from heartbreaking departures to joyous returns. Musician Adam Cooke, performing at the book launch, shared with the crowd his own experience, standing on the Canso Causeway at midnight, 1999-2000, accompanied by a single friend, waving flags from Nova Scotia and Canada. August 13th, 1955, was an historic day in Cape Breton, one most people remember for one of two reasons, because they were there, or because they weren’t there. It was a day when, officially, 100 pipers marched across that rocky mile, but in fact hundreds more pipers joined in, as well as an estimated 20,000 civilians who also took that walk. Significantly, it was a walk from the mainland side to Cape Breton, a flow of people that would soon reverse itself. In the 118-page When Canada Joined Cape Breton, there are photographs of individuals and moments and memories that make the book a valuable part of any Cape Breton library, and as the massive plans to celebrate the 50th anniversary this year (August 7th-14th) unfold from the planning headquarters at the Creamery, Elaine Ingalls Hogg’s book is certain to become a near biblical presence in the hands of those returning for the sheer joy of crossing the Causeway once again.